Using these links, try G Suite FREE trial. This promotion is valid for the whole of 2019, you can go directly to try it through the link below . 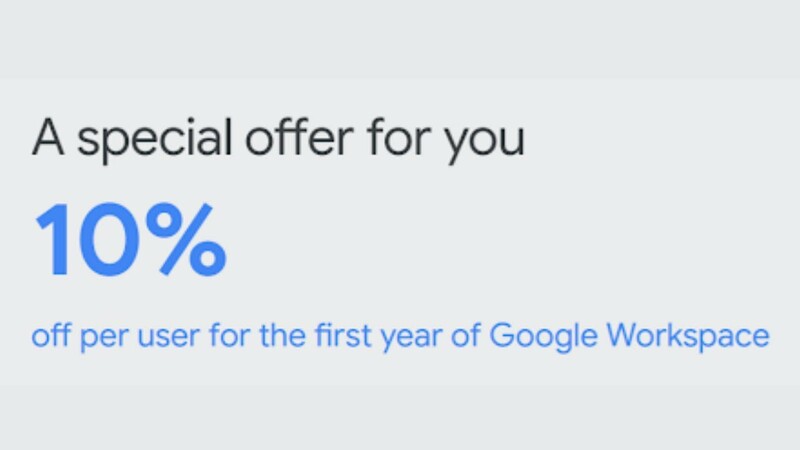 If you want to try it before buying, you have these coupons G Suite promotional codes offer 20% discount for the first year, use them to sign up, but you can also use them if you have already registered and it hasn’t been more than 14 days after your registration. 1 G Suite Free trial – How to get GSuite for FREE ? 2.4 Request New G suite Coupon – Can’t find a Coupon that works? 2.5 Where do I enter the promotional code? 4.1 GSuite Price – How much does G Suite cost? G Suite Free trial – How to get GSuite for FREE ? Following these steps you will be able to create a Free G Suite account and you will be able to use the free G Suite for a few days. To access the free G-Suite version and the discount coupons it is important that you access from the link corresponding to your country and zone. Argentina, Brazil, Canada, Chile, Colombia, Mexico, Peru, United States, … . 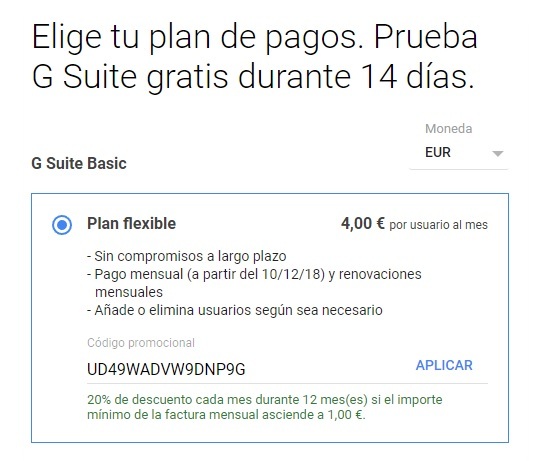 You can enter the promotional code coupon G Suite in the Billing section of the administration control panel when you register (with the link to your country) or during the trial period of 14 days (after more than 14 days it will not be possible), and this way you will have a Google Suite discount. Request New G suite Coupon – Can’t find a Coupon that works? Spain, Belgium, France, Germany, Ireland, Italy, Netherlands, Portugal, United Kingdom and United Arab Emirates. Poland, Russia, Ukraine , etc …. Korea , China , Thailand , etc… . STEP 3 – If you haven’t found a valid one, fill in the form and ask us for a new and personalized discount coupon. If you did not enter the promotional code while your registration, once registered in G Suite, you will be able to log in to GSuite with your domain name and selecting the Administration Control panel. At the top right of the Control panel, you will see the red “Set up billing” button. Clicking on it and it will open the Configuration Billing window, in which you can enter the promotional code in the corresponding field. If you need to enter this code after entering the billing details, you will find the option in the Payment Plan section of the Billing section. Note: It is important that you access from the link of your area or country, because if they do not work and tell you that they are invalid, the coupons can not be applied. We are sure that G-Suite is very good as we have been using it for years and we highly recommend it to everyone. If you are not sure, you can use it for FREE and in case you decide to buy it, with these coupons of promotional codes you will be able to use it for the first year with a 20% discount. We have tested the 2 suites and we believe Gsuite suite is much bether than Microsoft Office 365 suite. GSUITE, formerly known as Google Apps with its recent name change, is a cloud-based productivity package for your business that will help you complete your work no matter where you are or what device you use. G-Suite is a powerful (productivity application suite) 100% web (cloud-based) suite that helps businesses and teams communicate, collaborate and work from anywhere and on any device. It’s easy to set up, use and manage. So your company can focus on the really important issues. Many companies and organizations around the world rely on G Suite for professional emails, file storages, video conferencing, online calendars, document editing and much more. It is important to provide a professional look for the company; for your communication purposes you can use a personalized address such as [email protected] Gmail’s simple and powerful features help you build your brand and work better. You’ll be able to create a one-step business email account instead of Google Gmail’s user account. So there’s no need for a step-by-step user gmail account. Check emails, share files, edit documents, participate in video conferences, and more, whether you’re on the go, in the office, or at home. You can continue working from a computer, tablet or phone. A powerful administrative setup gives you complete control over users, devices, security, and more. Your information always belongs to you and will go with you even though you switch to other solutions. Contains: Mail, Google Calendar, Google Drive, Google Docs and much more. With a company account you can have your users. You can use gmail as an email with your domain even on drive. Google Apps has all the tools of Google and allows both individuals and businesses to have access to all services in a single administration panel, being able to access the several employees at same time. So you can create new documents in different formats, save them in the cloud, edit them between several workers and share it publicly or privately to a specific client. You can even connect with your customers through videoconferences where you can participate up to a maximum of 15 people. GSuite Price – How much does G Suite cost? From just 4 € per user per month, this is the official price list of G Suite in Spain. From these prices it is possible to get a 20% discount on G Suite for all users during the first year. From these prices it is possible to get a 20% discount the first year for ALL users of the company. To get this you can simply search for the code on this page. These basic and business available code deals are good for an email plan promotion of users. With Gmail for Work, you can get a personalized email with your domain and more. It helps employees streamline work and collaborate faster and more efficiently. Millions of companies of all sizes already use it. If your country or zone is not it the list, above there are some links to try G Suite Free.